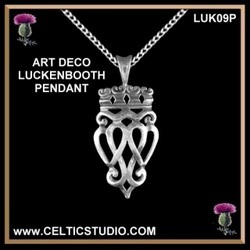 This pendant features a more modern Luckenbooth motif in the art deco design, popularized in the mid 1920s. The heart is surmounted by a crown representing loyalty to Scotland and Scotland's crown. 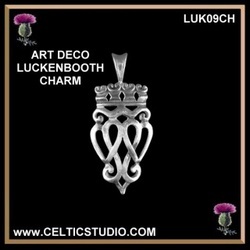 This gorgeous piece of Scottish jewellery can be custom made for you in karat gold. Please inquire on pricing. This beautiful modern sterling silver charm measures 1-3/8" (35mm) high by 1" (26mm) wide, a nice medium size................noticeable but intricate and elegant. This beautiful modern sterling silver pendant measures 1-3/8" (35mm) high by 1" (26mm) wide, a nice medium size................noticeable but intricate and elegant. The pendant includes an 18" chain.